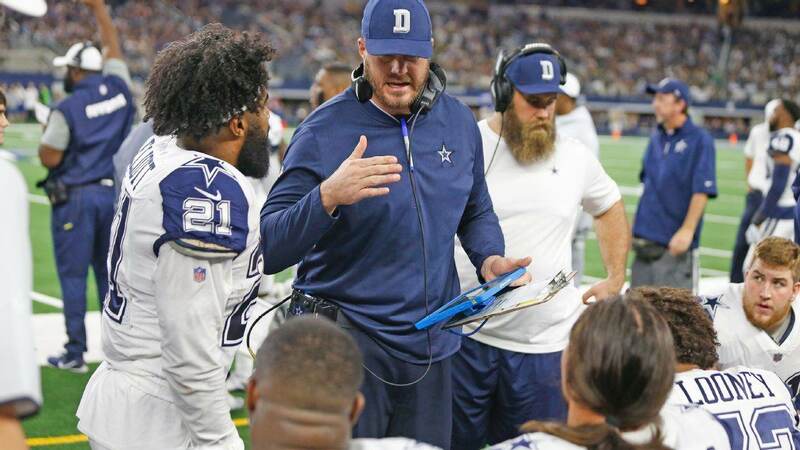 Hiring six new positional coaches and a special teams coordinator prior to the 2018-19 season, the Dallas Cowboys saw plenty of success with this turnover - rebounding from a 3-5 start to reach the Divisional Round before having their season end at the LA Rams. At arguably their most important position, the Cowboys admitted to hiring the wrong fit when Paul Alexander was fired mid-season. Very fortunately, Alexander's assistant was ready to step up and become one of the most respected coaches on the staff, with former Cowboys Tackle Marc Colombo receiving a new contract as OL Coach through next season. The team announced that Colombo would return on Tuesday. The day prior, Head Coach Jason Garrett said he expects Center Travis Frederick to be ready for the entirety of the offseason program. The two-time 1st Team All-Pro missed the entire season dealing with Gillian-Barre Syndrome. There's still work to be done this offseason for the Cowboys to maintain their usual standard on the offensive line. Just days removed from the end of the season, in which the Cowboys became the first playoff squad since 1988 to start all players under the age of 30, the Dallas OL is in great position and should remain an overwhelming strength under Colombo. With Joe Looney set to return to a backup role and Xavier Su'a-Filo under contract, even the Cowboys depth up front is built up nicely well before free agency or the Draft. Cam Fleming and Marcus Martin are the Cowboys offensive linemen with expiring contracts. The Cowboys averaged 136.9 rush yards per game under Alexander, who introduced an unfamiliar scheme to established veterans like Tyron Smith and Zack Martin. Alexander's time as the Cowboys OL Coach also stunted the growth of rookie Left Guard Connor Williams, who finished the season strong once returning to the starting lineup. The Cowboys allowed 56 sacks this season, 23 of which (41%) came in the six games under Alexander. Colombo had served as Alexander's assistant, believed to be a candidate to run his own OL room at some point. When that opportunity came sooner than expected, the Cowboys brought back former offensive line coach Hudson Houck to assist Colombo. A projected starting lineup of Smith, Williams, Frederick, Martin, and La'el Collins is what Colombo and Houck will have to look forward to when the Cowboys offense takes the field in 2019 - along with rushing champion Ezekiel Elliott and fourth-year Quarterback Dak Prescott. Colombo described himself as the "luckiest guy on the planet," when asked about his opportunity to continue coaching with his former team. Tell us what you think about "Dallas Cowboys Re-Sign OL Coach Marc Colombo Through 2019" in the comments below. You can also email me at Sean.Martin@InsideTheStar.com, or Tweet to me at @SeanMartinNFL! Will Offensive Retooling “Fix” Cowboys for Remainder of Season?